Here, we will first summarize the experimental achievements over the last 7 years in cell and animal rejuvenation. Then, a comparison will be made between the principles of the cumulative DNA damage theory of aging and the basic facts underlying the epigenetic model of aging, including Horvath’s epigenetic clock. The third part will apply both models to two natural processes, namely, the setting of the aging clock in the mammalian zygote and the changes in the aging clock along successive generations in mammals. 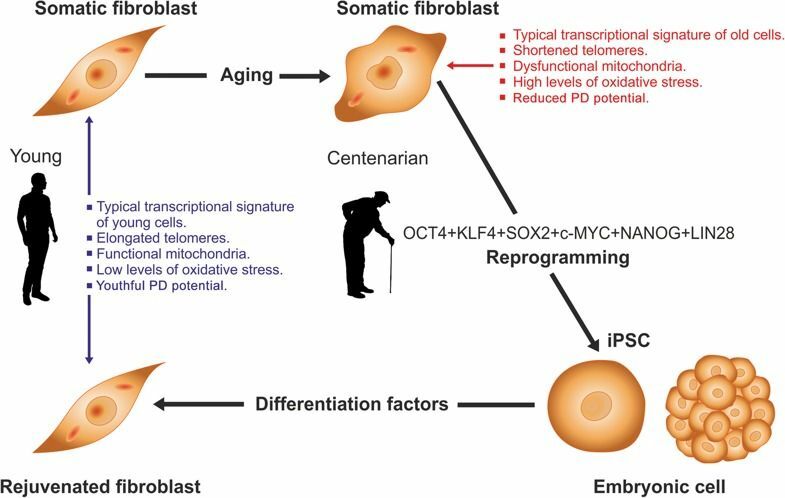 The first study demonstrating that skin fibroblasts from healthy centenarians can be rejuvenated by cell reprogramming was published in 2011 and will be discussed in some detail. Other cell rejuvenation studies in old humans and rodents published afterwards will be very briefly mentioned. The only in vivo study reporting that a number of organs of old progeric mice can be rejuvenated by cyclic partial reprogramming will also be described in some detail. The cumulative DNA damage theory of aging postulates that as an animal ages, toxic reactive oxygen species generated as byproducts of the mitochondria during respiration induce a random and progressive damage in genes thus leading cells to a progressive functional decline. The epigenetic model of aging postulates that there are epigenetic marks of aging that increase with age, leading to a progressive derepression of DNA which in turn causes deregulated expression of genes that disrupt cell function. The cumulative DNA damage model of aging fails to explain the resetting of the aging clock at the time of conception as well as the continued vitality of species as millenia go by. In contrast, the epigenetic model of aging straightforwardly explains both biologic phenomena. A plausible initial application of rejuvenation in vivo would be preventing adult individuals from aging thus eliminating a major risk factor for end of life pathologies. Further, it may allow the gradual achievement of whole body rejuvenation.